Thank you for becoming a Rotary Charity Fundraiser. We trust you have an enjoyable time competing in the event or activity you have chosen knowing that you have at the same time helped a charity or good cause. As soon as we have received notification from the event race office or an authentic request from you that you have registered for your chosen event we will send you a welcome email. This will confirm the event or activity and the date it takes place. It will also confirm your pledge and the charity you have chosen to benefit from your fundraising. The immediate thing you must then do is set up your online fundraising account. Even if you intend to collect most or all of your funds offline you must still set-up an online fundraising account. Make sure you also use it to record the off line funds you have collected (only record the funds you actually have to hand - do not count pledges). This is often the only way we know how you are progressing overall with your fundraising. You will need to send us any offline funds as you collect them if you wish them to be included in the total we hold. We will need to contact you when your fund reaches important threshold points for your event or activity in order to despatch the appropriate Packs or Payment. 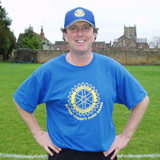 As soon as the opening of your online account is confirmed to us you will become an active Rotary Charity Fundraiser and within a few days will receive your FUNDRAISER PACK comprising: RCF Fundraising Pack, RCF Training 'T' shirt and RCF Baseball Cap. Included in the fundraising pack are two Letters of Authorisation, four Sponsorship Forms and four GAD forms as well as a letter from us and copies of the forms in this section. Please ensure your sponsors fill in all the details on the Sponsorship Form so that Gift Aid can be claimed if the sponsor is a qualifying UK taxpayer. Remember Gift Aid adds 25% to all qualifying donations. If a qualifying sponsor wishes to make a large donation print off and use one of our GAD forms. Then pop it and the cheque in the post. Our address can be found on the General Information page.